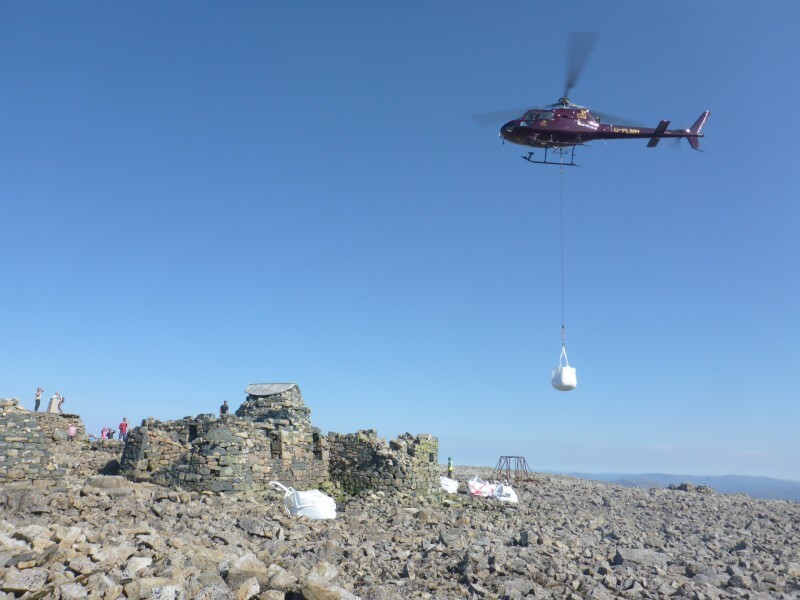 This week, our upland Ranger team have taken delivery of 75 tonnes of rock onto Scafell Pike. 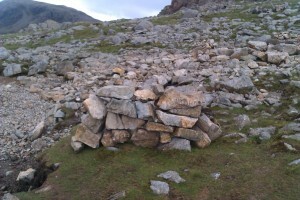 Gathered from the surrounding fell sides, it will be used to repair erosion on the ever popular Brown Tongue route to the summit. The team are planning to do 200 days of work on this route at a cost of around £42,000; this is only the start of the repair works and the plan is to carry on at this level for at least the next 5 years. So…………….. Consider donating as part of your challenge, It costs about £150 to repair 1 metre of pitching and there’s a lot of mountain to fix. Volunteer your groups time, join the Rangers and help put something back. Now this is a proper challenge. Follow our guidelines, if it ain’t eroded, it don’t need fixing – avoid shortcutting and keep to the pitched paths not on the grass to the side. 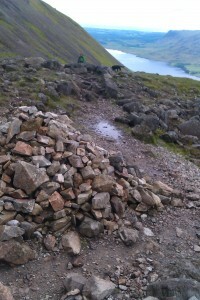 They’re part of a path re-alignment project across Wasdale. 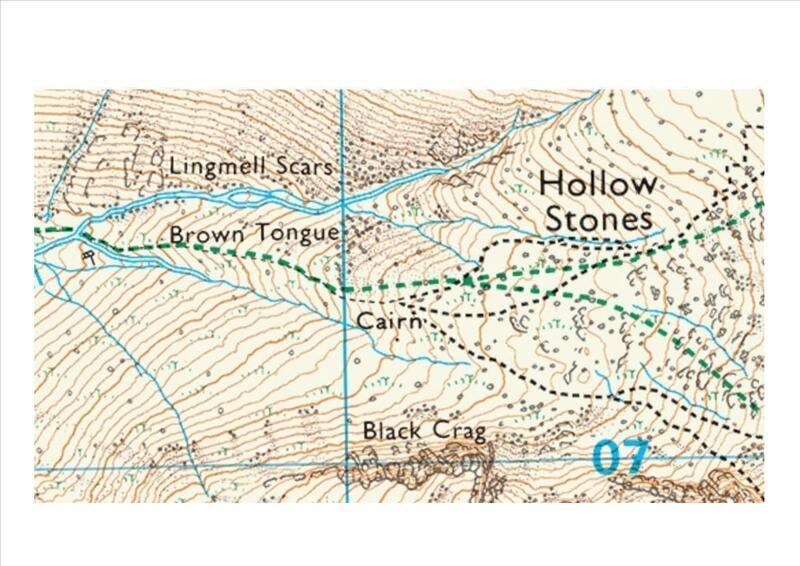 DON’T PANIC, the paths aren’t moving, we’re just adjusting the maps so that the line on your map will actually correspond with the path on the ground unlike this map of Hollowstones on Scafell Pike. Hopefully the changes made will help with navigation in the future and make maps more accurate and readable. The signs will be removed in early May. 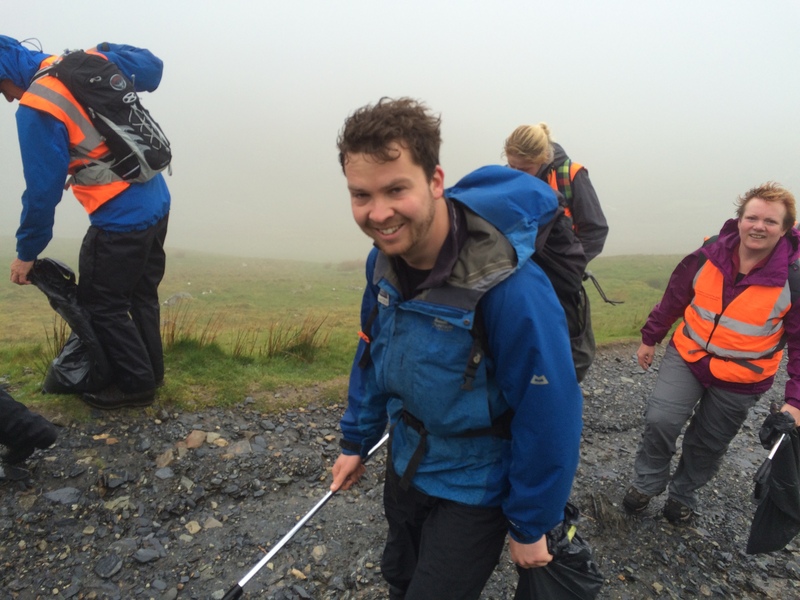 Volunteer Wardens return on Snowdon! 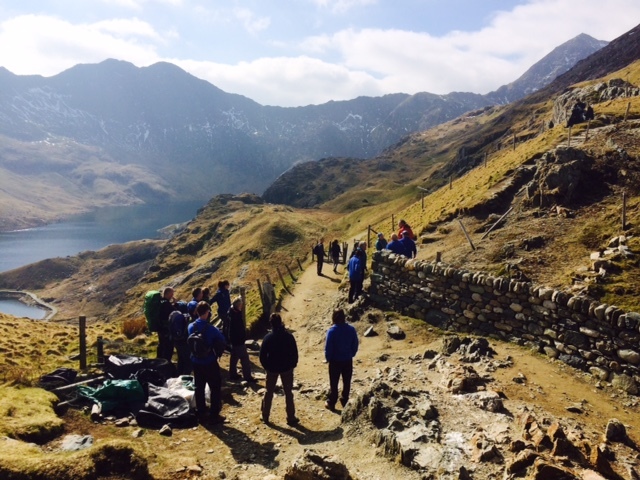 We’re very fortunate here on Snowdon to have a team of Volunteer Wardens and we were delighted to welcome them back early this year for Easter and the new season ahead! 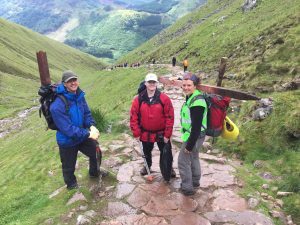 The role of a Volunteer Warden is diverse with every day different to the next. It can be challenging at times especially in extreme weather! 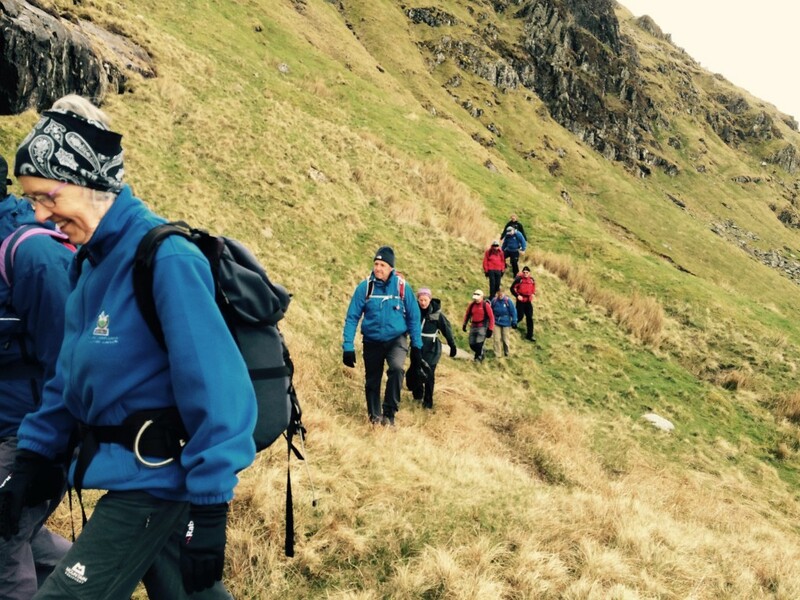 The role includes providing information, advice regarding route choice and the importance of safety on the mountain whilst out on the busiest paths. They also do some path maintenance and litter picks which goes a long way towards reducing the problem. Some have been with us from the start but it’s also great to welcome new faces to the team! 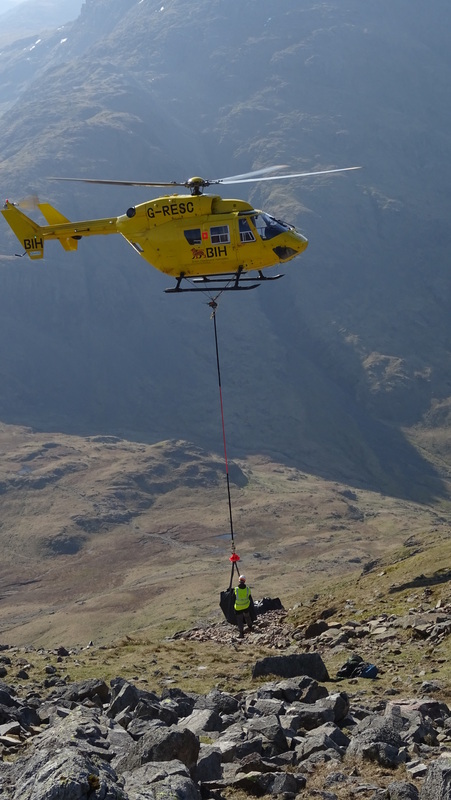 This year there’s ten new Volunteer Wardens joining the team so before Easter we had a day to welcome everyone and provide some training whilst out on the mountain. It was great to see the Volunteer Wardens that’s been with us from the start sharing their experiences with the new group. We had a few scenarios whilst out in different locations on our journey. This included providing information to a group at Bwlch y Moch regarding the conditions on Grib Goch and talking to mountain bikers by Llyn Llydaw about the voluntary agreement on Snowdon. 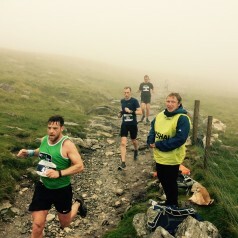 We really appreciate all their efforts and commitments here on Snowdon and we look forward to working with them in the new season and hopefully years to come! Autumn and winter brings a very different feel to Snowdon. By the time November arrives many of the things that add to the hustle and bustle of Spring and Summer have gone: the train and Hafod Eryri (summit building) have closed, most of the mountain birds are either gone or quiet and the number of hill walkers are now much less. 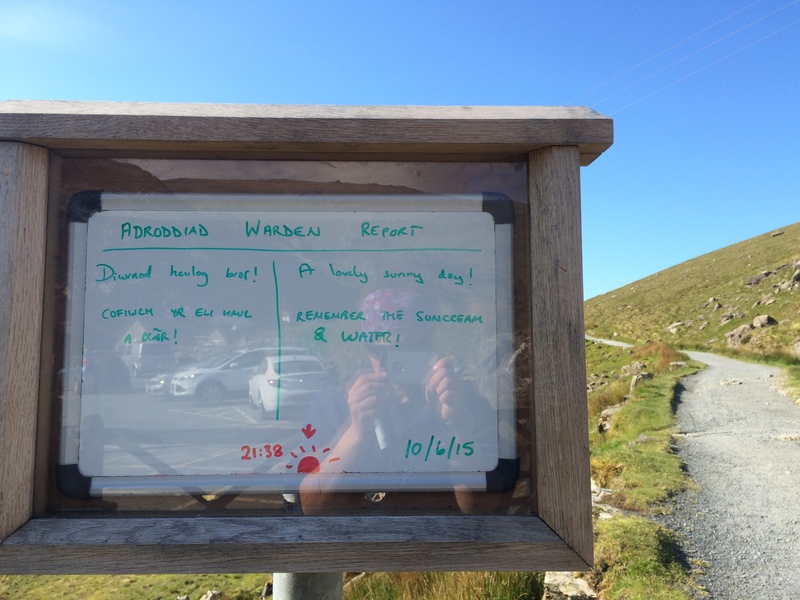 However work continues on Snowdon throughout the year and late autumn gives the Wardens and Estate workers a timely window, between the busyness of summer and the snow of winter, to do some much needed repair work to the paths. 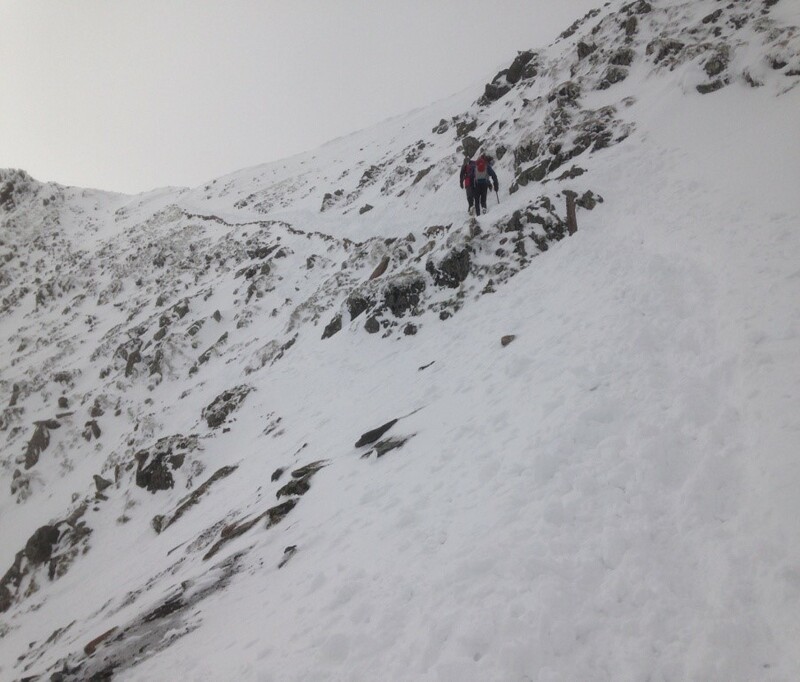 November marks the start of our Ground Condition Reporting which report on the winter conditions on Snowdon throughout the winter. 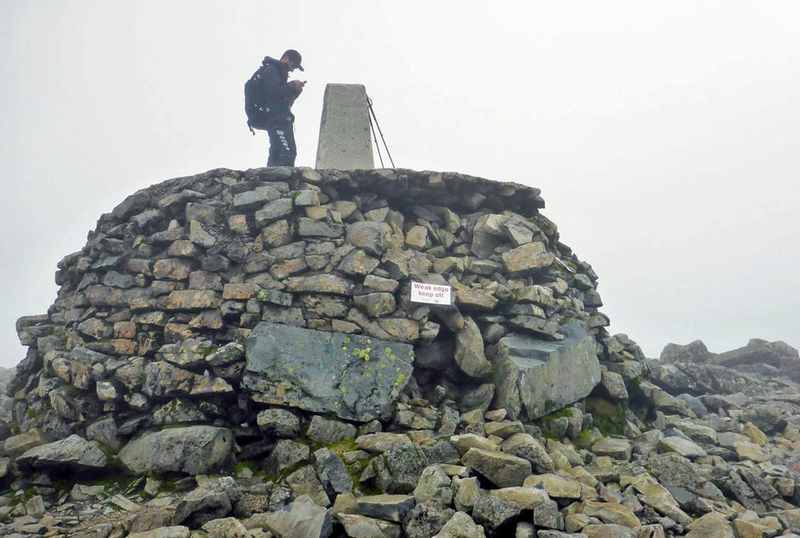 The Wardens head up Snowdon to assess the snow conditions with the aim of compiling a simple report, for the public, of what the conditions are like. In addition the the conditions the Wardens will give some basic advice on what sort of equipment the conditions dictate. These reports are compiled 3 to 4 times a week and are submitted to the Met Office to display on their Mountain Forecasts. The mountains are very different place in winter, the weather conditions and short days combine to make a hike a much more serious undertaking. Taking a look at the forecasts is essential for an enjoyable day in the mountains, as is the appropriate kit. 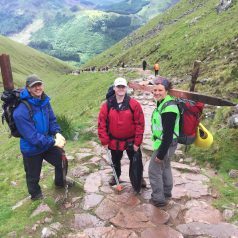 Vital work has begun this week on Britain’s highest mountain to upgrade and repair over three kilometres of the Ben Nevis Mountain Path. This ambitious project will stabilise and improve over half the total length of the track between Achintee and St. John’s Wall as part of a £1m project lead by Nevis Landscape Partnership and funded by Heritage Lottery Fund, Scottish Natural Heritage and Highlands & Islands Enterprise. 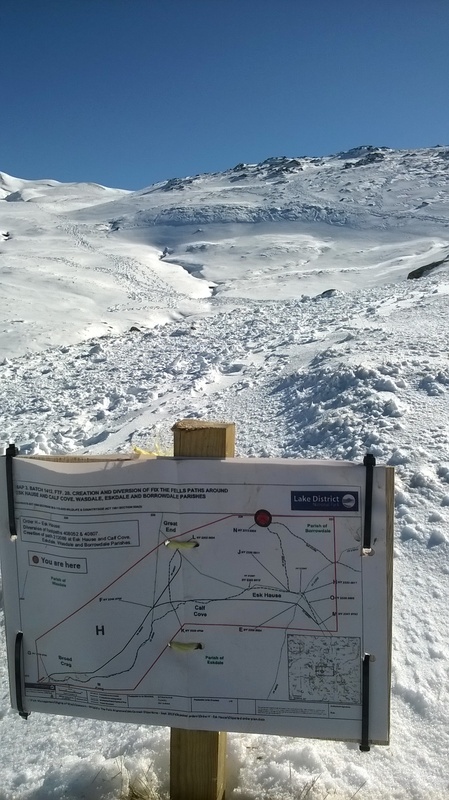 In total the work will take three years to complete, with this year’s contracts running from now until March 2016 to avoid the mountain’s extremely busy spring/summer period. The work carried out each year will dramatically improve this world class route. 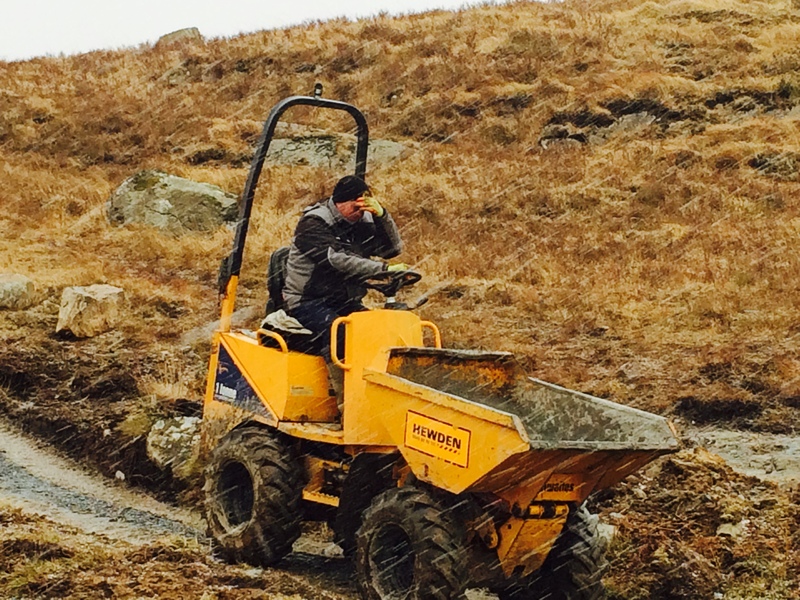 The work sites present major safety considerations, both for the contractors and the people using the path during the construction phase, due to the steep cross‐slope that the path is benched into which zig- zags up the mountain. Walkers may wish to consider alternative routes up the Ben during the this period such as starting at the North Face car park, however those choosing to take the Mountain Path should be aware of the works and follow the bypasses and instructions from the on-site contractors. 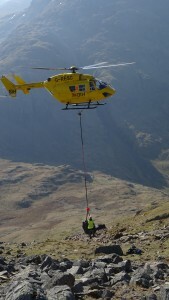 We would also like to advise extreme caution for any night climbs or descents using the Ben Nevis Mountain Path during the construction period. 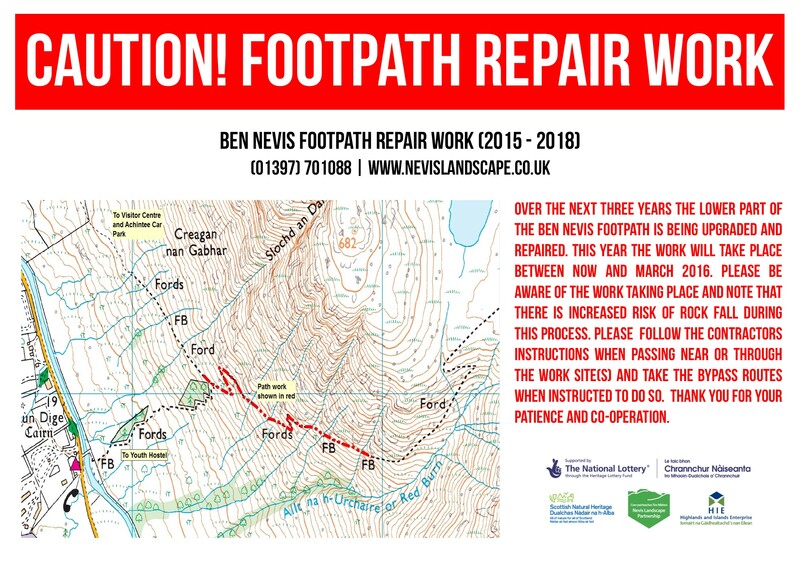 The Ben Nevis Mountain Path is an extremely popular and well-used route and very much in need of these works to improve long-term stability of the path and reduce erosion. 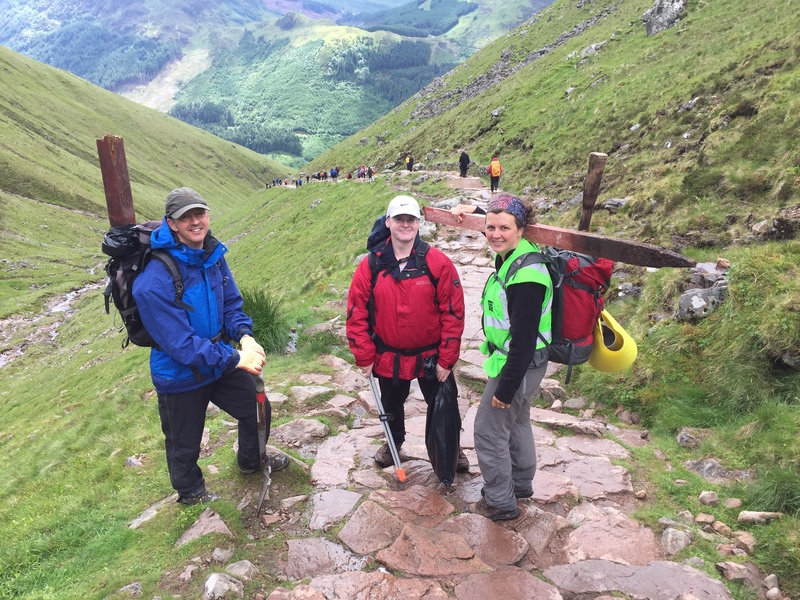 Ben Nevis visitor numbers are in excess of 100,000 annually and in addition to individual walkers there is an ever-growing number of charity climbs, challenge events and Three Peak groups. 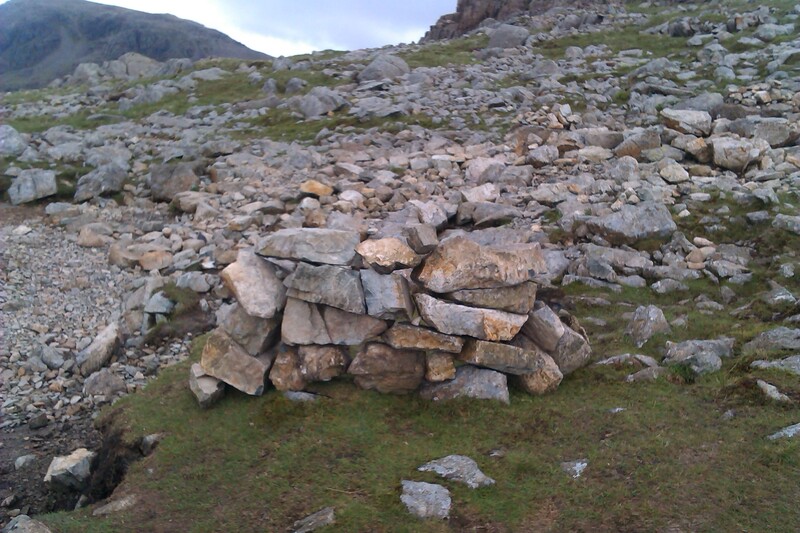 The lower Ben Nevis Mountain path is currently in a very poor condition and we need to take action now in order to safeguard the mountain path for future generations to enjoy. 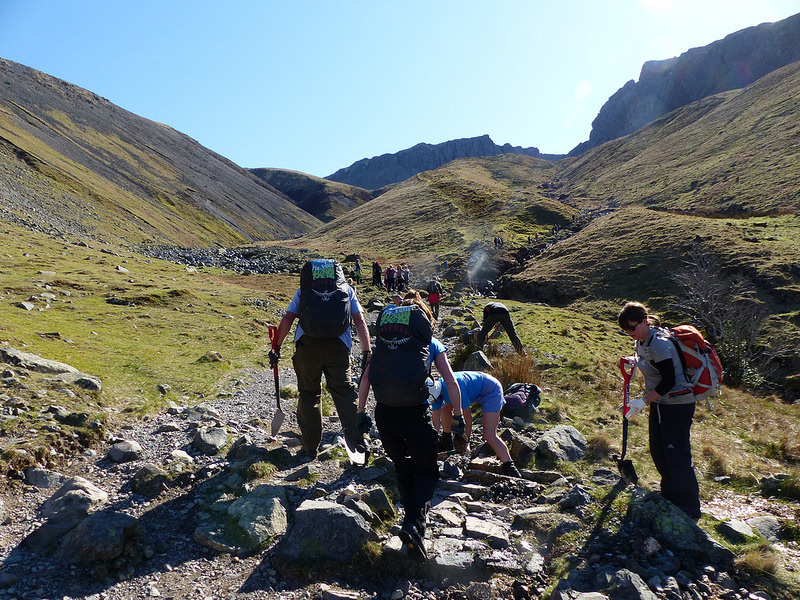 One way to alleviate unnecessary pressure is to ensure you register your group events with The Three Peaks Partnership or Ben Nevis Visitor Centre. 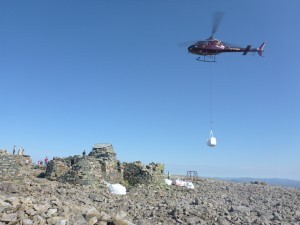 To find out more about the work going on and around Ben Nevis, and how you can get involved and support it go to www.nevislandscape.co.uk. 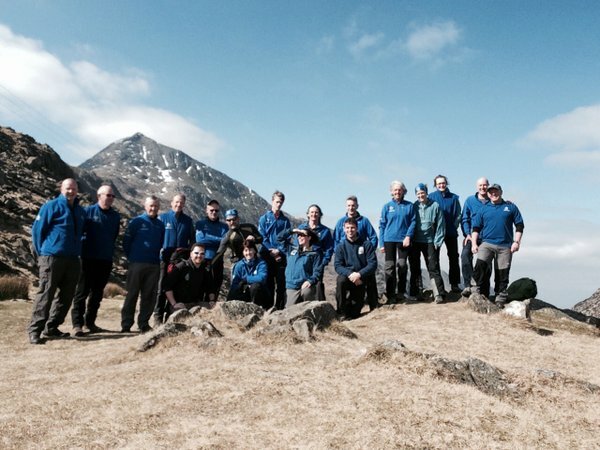 The Nevis Landscape Partnership Program is a 5 year £3.9m scheme, consisting of 19 projects aiming to encourage the public to engage with the natural and cultural environment of both Ben and Glen Nevis. Across the program there are opportunities for people get involved through volunteering, school participation, experience events and training opportunities. 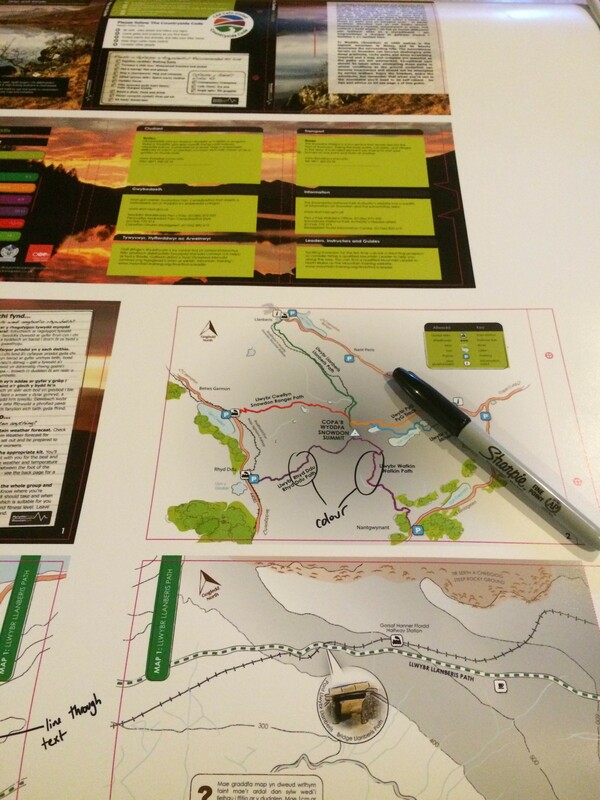 In addition we have a major ‘leave no trace’ interpretation project to promote sustainable use of the area. Our key partners are: Heritage Lottery Fund, Scottish Natural Heritage, Highland Council, Forestry Commission Scotland, John Muir Trust & The Nevis Partnership who are the host organisation for the programme. In addition we have a number of smaller funders feeding into specific projects. Although we like to make it look like the mountain manages itself, there’s a lot that goes on behind the scenes on Snowdon. The 450,000 walkers a year ascending on foot to the highest point in Wales bring huge benefits to the local area, but also huge pressures. 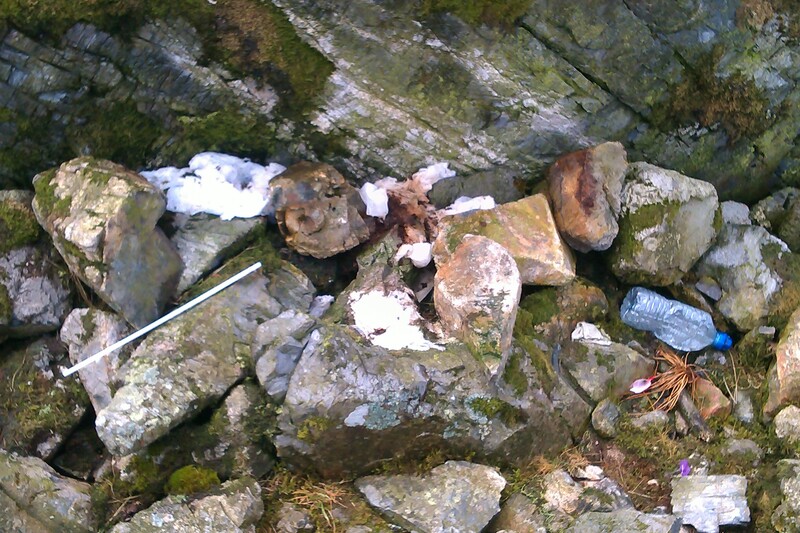 As Snowdonia National Park Wardens our job is to look after the mountain and the people who use it. 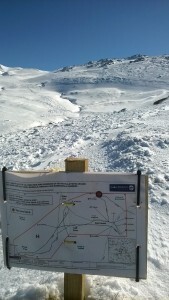 We protect the landscape and wildlife but also work to ensure that the people who visit the mountain have a great time. Phew! 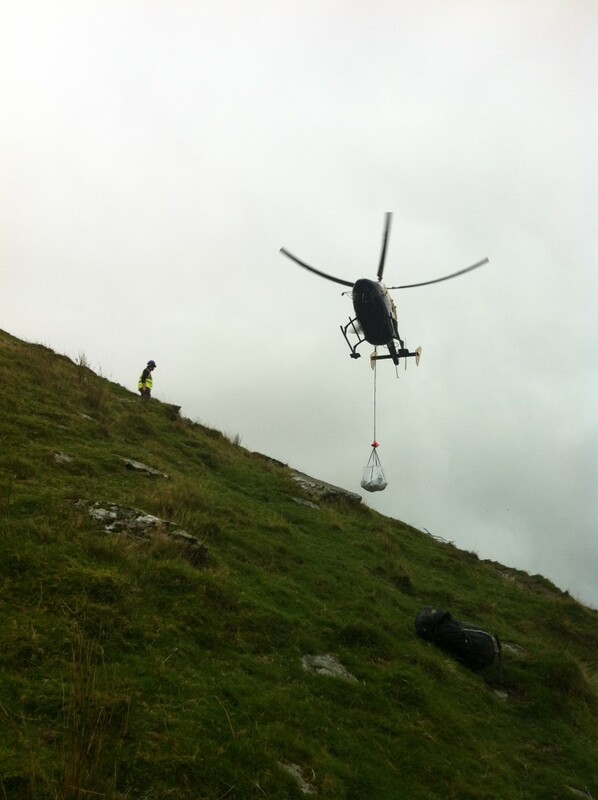 And that’s just the staff and volunteers who work for Snowdonia National Park! 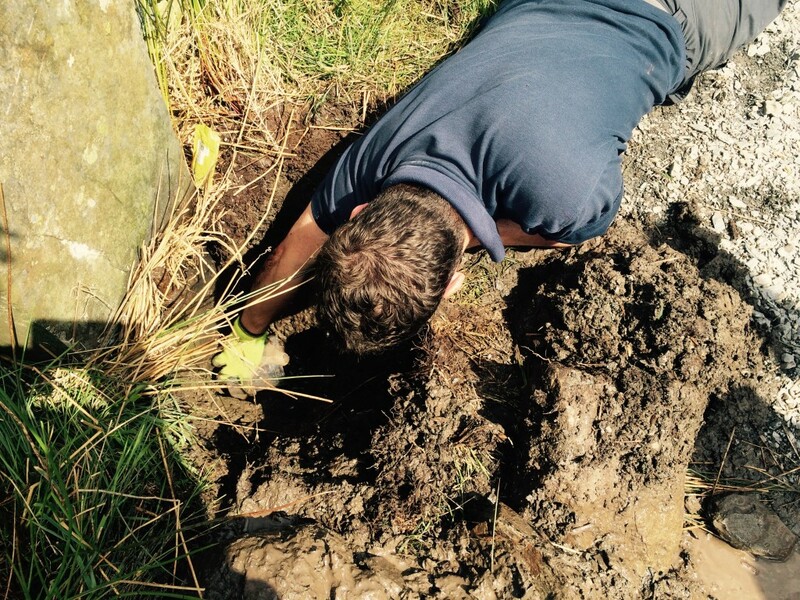 Warden Rhys Wheldon replacing a broken gate post – muddy work! Attention all 3 Peakers… Scafell Pike needs your help! 1) As a rule of thumb, whatever you take up the mountain in your rucksack, please bring back down. Plastic bottles, gel wrappers, fruit peel… why not invest in a re-usable water bottle? It’s multiple use will save on plastic waste. In addition, if you pack all your food in a lunch box, it doubles up as a handy receptacle for your wrappers, cores and peel. 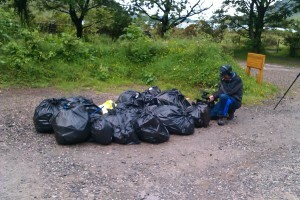 We don’t provide bins in Wasdale so please bring black bin bags with you on your challenge. 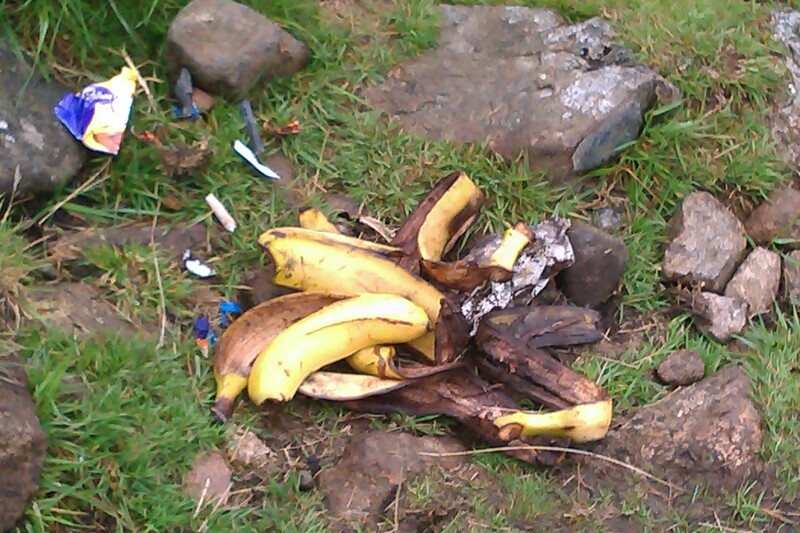 Bag up your rubbish, hurl it in the back of your minibus and bin it when you get back home. In addition, you can join the latest social media campaign #mountainmagpie and be a mountain hero! 2) When you’ve got to go, you’ve got to go…. 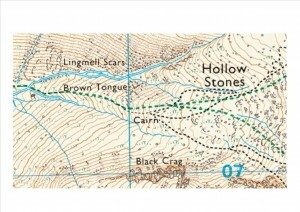 check out this great article from UKHillwalking.com for everything you need to know about getting caught short and really needing the loo in the hills. 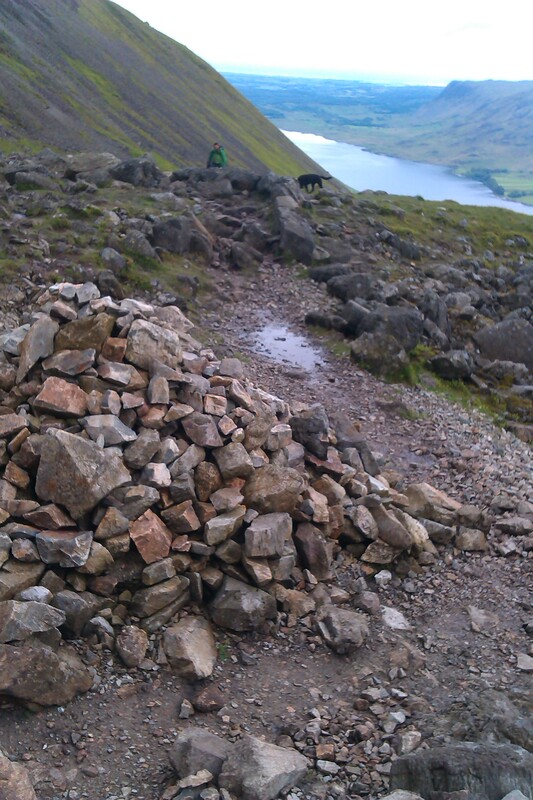 3) Our mountain paths are fragile and really need their stone coverage. Removing stones from the paths only hastens their erosion. Please resist the urge to create new cairns or add to current ones. Tramp up on the path and please leave the stones where they are! 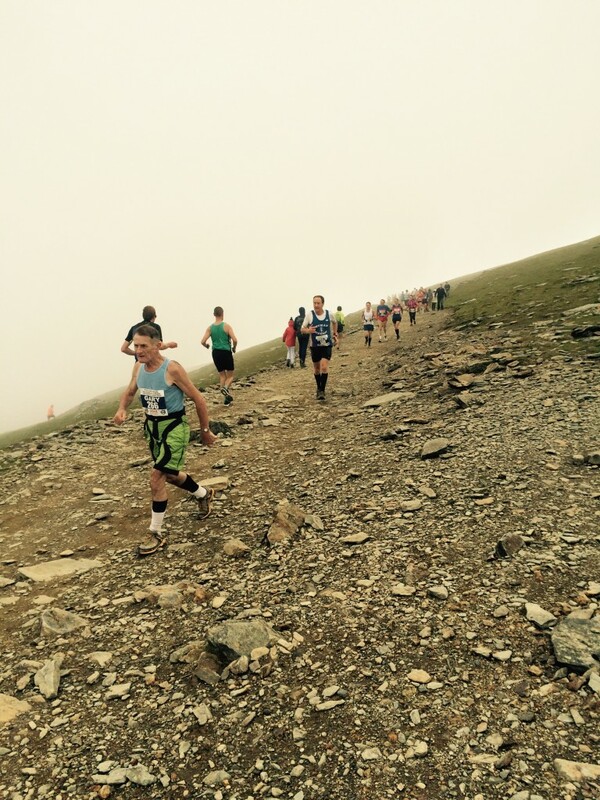 So remember… 3 Peaks, 3 really simple guidelines. Have a terrific time on your challenge and help to prevent the Rangers from ranting!! What a day! 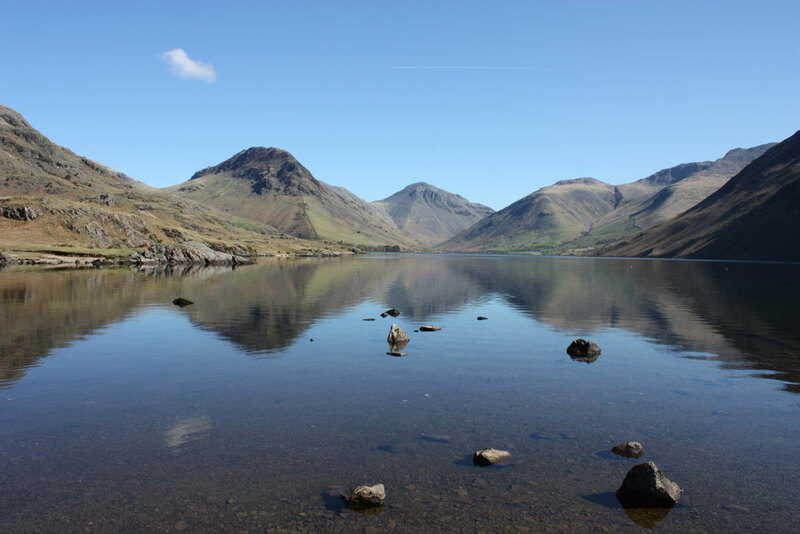 A thirty-four-strong team of staff and volunteers set to work on Scafell Pike on Saturday on the hottest day of the year so far. 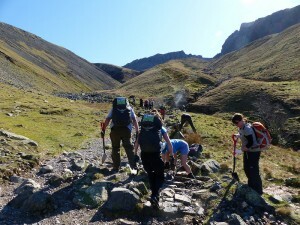 Laying siege on the mountain with spades, brushes, litter pickers and black sacks, the team summited the Pike on every major route from Wasdale, Borrowdale and Eskdale; clearing drains, sweeping paths, picking up litter and generally enjoying the grand day out. So, what was the day all about the? Well, unfortunately our narrow paths leading to the summit of England’s highest mountain are no longer able to cope with the demands of challenge events and visitors on them.